Pettitt’s SuperValu, Saint Aidans –This supermarket has a strong reputation for being customer and community focused. Their customer service is excellent. A huge amount of time and effort is put into working with local suppliers to offer customers high quality, local produce at good value prices. Wexford eCommerce & Social Media Award sponsored by ESET Ireland. Scurri – Founded in Ireland in 2010 by Rory O’Connor (CEO) with the vision to make delivery simple for ecommerce. Fuelled by the global growth in online shopping, Scurri has offices in Wexford, Dublin and London. Danone Nutricia Early Life Nutrition (Wexford) – A major global business, focusing exclusively on products that bring health benefits to their consumers. Danone is the world leader in Dairy, Water and Baby nutrition products, with well-known brands including Actimel, Evian and Cow & Gate. Scurri – A cloud based carrier management platform that integrates parcel carriers and merchants, quickly and cost effectively. Scurri technology is used to manage parcel deliveries for some of the world’s biggest online retailers. Carragh Paving & Landscapes – Having established a national reputation as “the paving and landscaping experts” Wexford based company Carragh Paving & Landscapes continues to deliver the very highest standard of work. Wexford Home Preserves – A family business, run by Tom and Laura Sinnott who have been making the very best jams, marmalades and other delicious preserves for more than 25 years – using all natural ingredients and making all of their preserves by hand. Retrofit Ireland – A brand leader in energy awareness and the building of energy efficient homes. This company constructs new buildings to the optimum attainable energy rating and also offers service to retrofit existing homes to the same high levels of energy efficiency. Natural Health Store – A family-run health store in the heart of Wexford’s busy Main Street, where you will find a Nutritional Therapist, a Food Intolerance Tester, a Bach Flower Practitioner, a Beauty Therapist, and a Hair Mineral Analysis practitioner. Talbot Hotel Wexford – The 4* Talbot Hotel Wexford is ideally located in the heart of Wexford Town. It is one of the finest hotels in the county offering exceptional service – it boasts a vibrant bar, conference facilities and a fully equipped leisure centre and swimming pool. Gainfort Academy – Provides training focusing on the latest trends and techniques for qualified professionals in the hair and beauty sector – offering students the most comprehensive & complete training packages. Mary Barry’s Seafood Bar & Restaurant – Renowned for its locally caught fresh seafood from Kilmore Quay and offering specials on a daily basis at superb value. In the summer months you can even choose your own oysters and lobsters fresh from the in-house sea tank. BNY Mellon – Corporate Social Responsibility (CSR) is at the core of this company’s business strategy. It enables them to power global investments and growth, earn the trust of their clients and stakeholders, and innovate for a better world. Morriscastle Strand Holiday Park – a four star tourist caravan, camping and private mobile home site, owned and operated by the Darcy Family with the present generation carrying on the family business which has been going since 1969. Morriscastle was one of the first Irish camping destinations. The Nail Boutique – Provides a service that brings innovative products, a wide range of colours and the latest techniques from the nail industry and at the same time provides a relaxed and social atmosphere for clients to have a tea/coffee and to socialise with each other. Conor Brennan, Zurich Insurance – Chief Executive Officer at Zurich, Conor is a consummate professional, who understands what it means to lead others, to navigate change and to balance the needs of the business with the needs of clients in an authentic fashion. Conor is astute, intuitive and strategic. In addition to his business acumen and commercial sense Conor’s key strength lies is his ability to build enduring relations, an imperative for success. Bert Allen – a very successful Wexford entrepreneur. 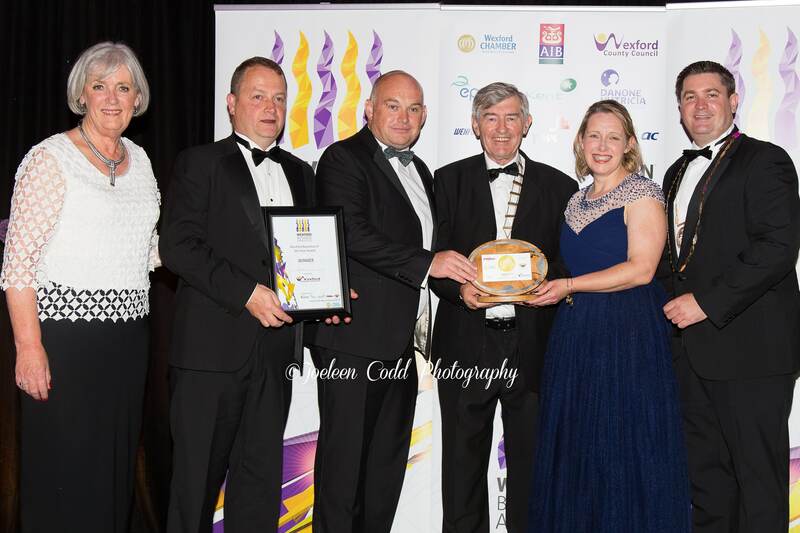 Bert and the Allen family have had enormous success in their many business ventures including the Linden Food Group, which includes Slaney Food and Irish Country Meats, the Bewley Hotel chain, a property portfolio in Germany and the United Kingdom. They are also investors in wind energy among many more successful enterprises. Bert is a collector of iconic Irish furniture designer Eileen Gray’s work, and has restored her former home, Brownswood House in Wexford. Scurri – winner of this year’s eCommerce and Social Media Award, Innovation Award and joint runner-up of the Logistics Award. Scurri provides a cloud based carrier management platform that integrates parcel carriers and merchants, quickly and cost effectively. Scurri believe in great customer service to their ecommence clients which can be demonstrated by their NPS (net promoter score) of 8 which is the highest in their industry. They understand their customers’ needs which can be demonstrated by the innovative approach of providing a smart labelling technology that extends the delivery of their clients brand message directly to their client customer’s hands.